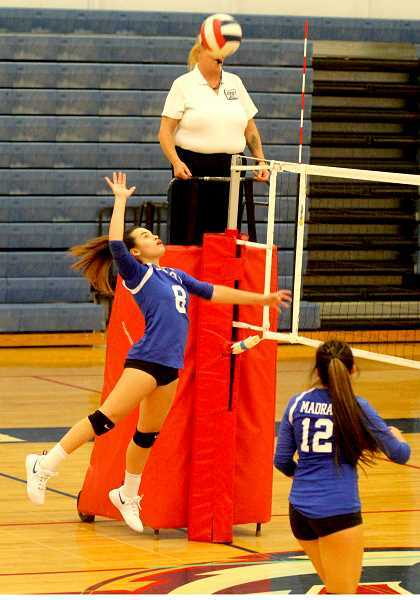 Madras White Buffalo volleyball program loses three straight games after good start. The Buffalo volleyball team lost to North Bend 2-0 at the Sisters Invitational Sept. 22. Madras had three pool play games before bracket play. The Buffs played Burns first in pool play and lost 25-12, 25-15 before playing Sisters next. Madras lost to Sisters 25-16, 25-9 and faced Klamath Union in their final pool play match. The Buffs split a pair of sets to Klamath Union, winning the first set 25-20, before losing the second set 25-13. Bracket play began and the White Buffalos found themselves facing 5A North Bend. Madras lost 2-0 in very close hard fought sets. The Buffs lost the first set 25-23 and lost the second set 29-27. "The game was back-and-forth," head coach Brianna Hewson said. "We held tight with them, but unfortunately, could not capitalize on our moments at the end. The girls played amazing, had some really good digs. We made some mistakes that helped them get the win." "The Sisters tournament is always a stacked tournament of the top 15 teams in Oregon; 10 of them were there," said Hewson. "It is always great competition for our girls." Madras setter Niyalee Cochran led the team in kills with seven and Sophia Courville with five. Libero Korie Johnson finished the game with 15 digs and Cochran, eight. 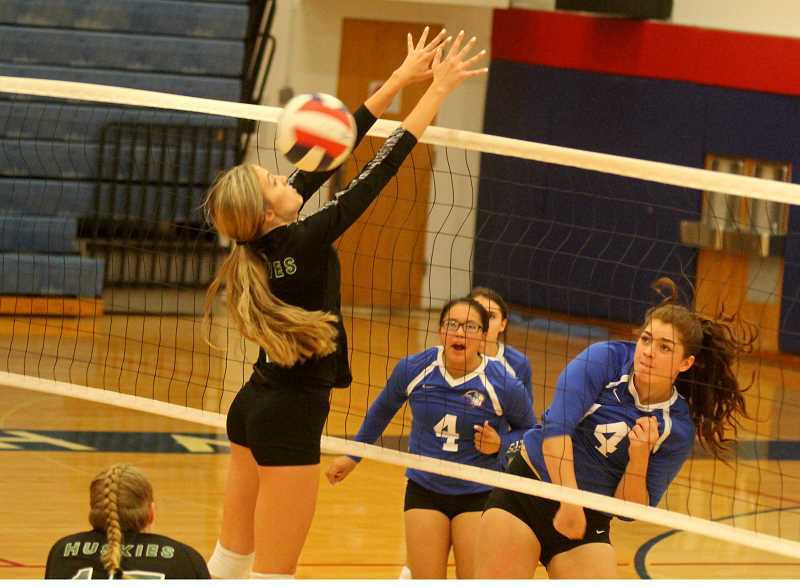 The Madras White Buffalo volleyball program also lost their first two league games this season. The Buffs lost to Corbett 3-0 Sept. 18, and lost to North Marion 3-1 Sept. 20. Madras was host to the Huskies and won the first set 25-21. The set was tied 11-11, when a big spike from Courville changed the momentum of the set. An ace by Erica Desjardins and another big hit by Courville gave the Buffs a 17-13 lead. A Desjardins kill advanced the Buffs lead to 22-18 and led to a North Marion timeout. After the timeout, Madras went on a 3-1 run and the set was ended by a Courville kill. The Buffs started the second set slow and found themselves down 7-3 early, then later down 10-5. Madras fought back with an Olivia Symons ace and a Jen Binning kill, cutting down North Marion's lead to 11-8. With Madras fighting back, Niyallee Cochran served an ace to tie the score at 14-14. North Marion scored three points in a row and Madras called a timeout to regroup. After the timeout, North Marion ended the second set on an 8-2 run, winning the second set 25-16. "Niyallee has been really good at reading the ball this year," Hewson said. "She stays on her toes and goes for everything. She has completely upped her game as far as attitude, skill, reading the floor. If she is sees an opportunity, she is going to take it." Cochran started the third set with an ace, giving Madras a 1-0 lead, but North Marion was up 8-4 as the set continued. The Buffs again tried to come back from an early deficit. A kill and ace by Desjardins cut the Huskies' lead down to 13-12 and North Marion took a timeout. An Olivia Symons tip tied the game 13-13, but the Huskies went on a 5-0 run, forcing a Buffalo timeout. North Marion went on a 6-3 run at the end of the set, winning 25-17. Madras could not find their groove in the third set, going down 12-4 early. The Buffs had a small run that cut North Marion's lead down to 11-15, but the Huskies went on a 10-2 run to close out the set 25-13, and beat Madras 3-1. "From the beginning we knew North Marion had some tall girls, so we had to figure out how they were going to hit and where they were going to hit," Hewson said. "We started back deep, thinking they were going to hit hard on us and they took advantage of the short game, tipping short and by the time we made adjustments it was too late." Cochran led the team with four aces and Courville led the team in kills with nine. Johnson ended the game with 17 digs and Cochran with 15. The Buffs also lost to Corbett Sept. 18, during the first league game of the year. The Buffs lost 3-0, all three sets, 25-15, 25-15, 25-18. Desjardins led the team in aces with eight and Cochran led the team with kills with seven. Johnson ended the game with 12 digs. "The girls have come to me about working on specific things from these matches," said Hewson. "I am going to get the girls together, watch game film and see what we need to adjust and change." Madras has a home game against Molalla, Thursday, Sept. 27, at 6 p.m.